English 19th-century olive morocco by C. Lewis (? ); lettered: Missale Romanum; in green slip case. Arpajon de Lautrec (? ); arms on fol. 75v (gules: a harp or; but possibly the arms of the Psalmist); C. Taylor; T.S. Walker sale (London, 1886, no. 203) to Warton; Sotheby's sale (London, Mar. 19, 1896, no. 410) to Pickering for Richard Bennett; Catalogue of manuscripts and early printed books from the libraries of William Morris, Richard Bennett, Bertram, fourth Earl of Ashburnham, and other sources, no. 45; purchased by J. Pierpont Morgan (1837-1913) with the Bennett Collection in 1902; J.P. Morgan (1867-1943). Ms. book of hours for the use of Paris (Hours of the Virgin, Office of the Dead); written and illuminated in Paris, France, ca. 1500. 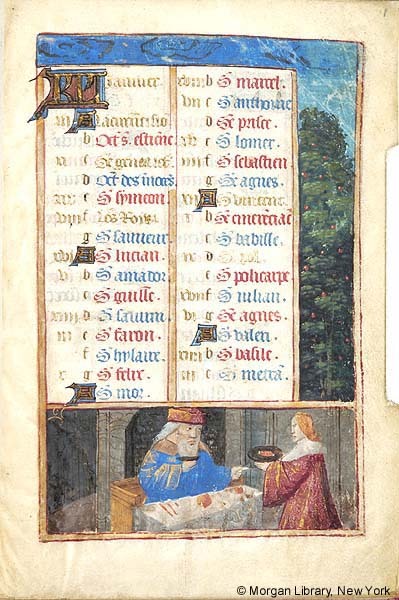 Decoration: 3 full-page, 13 large, and 14 small miniatures; 41 border vignettes; 12 calendar vignettes.